When freshly-minted Acura boss Jon Ikeda took over the reins earlier this year, he promised to do everything in his power to make Acura’s sedans as exciting within their segment as the NSX is within its segment. If Acura’s precision concept is any indication of things to come, we can expect big things from Ikeda and his design team going forward. 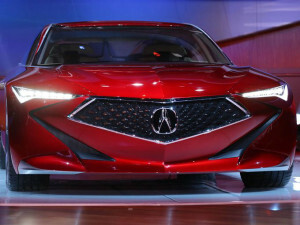 The angular design of the Acura Precision concept car, from its pointed hood to its swooping silhouette, suggests a shift towards edgier design for a company that in recent years has pinned its reputation to stately sedans and SUVs with an eye toward safety and technology. If Acura integrates striking design elements from its Precision Concept onto its current lineup of award-winning vehicles, it just might be able to dominate the luxury segment. The fact that two of the most exciting developments for Acura as a brand in recent years, the release of the NSX and the unveiling of the Precision Concept, are occurring now is not a coincidence. Acura celebrates its 30th birthday in March, and they seem to know how to celebrate in style. The 2017 NSX, despite featuring cutting-edge styling and technology, is a callback to the original NSX, which was the first Acura to grace posters and magazine covers. The Precision Concept, on the other hand, owes its appearance to nothing but Acura’s future. The hordes of lucky enthusiasts in attendance in Detroit were treated to scores of incredible vehicles, but it speaks volumes for the future of Acura that two of the most talked-about vehicles reveals of the last two years are both Acuras.